The UNCG softball team celebrates after defeating ETSU 7-2 on Sunday, March 7. The top-seed Spartans travel to Chattanooga this weekend for the SoCon tournament. Senior Day couldn’t have gone much better for UNCG Softball on Sunday. The Spartans defeated the East Tennessee State Buccaneers 7-2 to win a share of the Southern Conference regular season championship and earn the No. 1 seed in the SoCon Tournament. 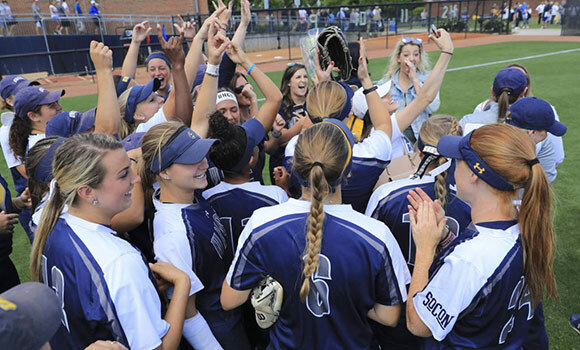 The championship is the first for UNCG’s softball team since joining the SoCon in 1998 and the first conference regular season title for the Spartans since winning the Big South in 1996. The team now turns its attention to the SoCon Tournament later this week in Chattanooga, Tennessee. To read the full story on the UNCG Athletics website, click here.